Ian: "Well it took me ten tries to stay on the back of that horse! But that last jump had me hitting the dirt!" (singing) "Maia said there'd be days like this. There'd be days like this, Maia said..."
Battling the Balrog is a messy job. 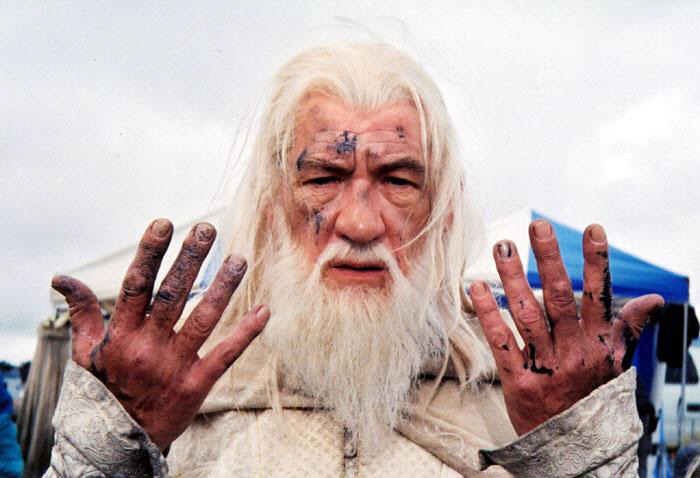 No, No, No you�re Gandalf the white, not Gandalf the bloody! "You mean this job can get even dirtier?" Blast!! I've broken another nail! Makeup- get me a manicure!!! "Peter, I really cannot work under these conditions. I know you wanted more Watchers in the story, but you never said they would squirt ink like an octopus!" "That's the last time I take Shadowfax to a Do-It-Yourself HorseWash!" Damn! Now why can't they just give us a simple "I voted" sticker instead of marking us up with this awfull ink substance in these Iraqi elections !! Hmm... I knew there'd be Gandalf the Grey, then Gandalf the White.. I don't remember Gandalf the Tar Baby in there anywhere. Gandalf: Pippin, I don't think that exploding Quill Pen prank was at all funny! "I thought M & M's were supposed to melt in your mouth...not in your hands!" New Tide Laundrey Detergent can get your whites whiter than white, and look it even removes sticky orc blood!